The benefits of massage are numerous; improved circulation, stress reduction, greater range of motion, release of feel good hormones, prevention of muscle injury and it feels good. But how do you know which type of massage is right for you? It can be confusing to stand in front of a spa menu and know which is best for you. Associated Bodywork & Massage Professionals (www.abmp.com), a national massage organization, estimates there are over 200 different massage techniques practiced today. As a massage therapist with over two decades experience I’ve taken a look at some of the most popular massage styles and what people are asking for. Swedish, a basic technique that most people are familiar with, is light work involving long strokes, kneading and percussion. This is usually done for relaxation and to increase circulation and is a style that is very popular amongst therapists. Similar to Swedish, Lomilomi or traditional Hawaiian massage uses a lot of circular movements and forearms. Lomilomi literally means “to knead or fold”. Light touch massage used to move the lymph through the body and flush the system. This technique is great for edema or swelling and detoxification. A popular spa technique in which hot stones (up to 140 degrees F) are placed on the body. 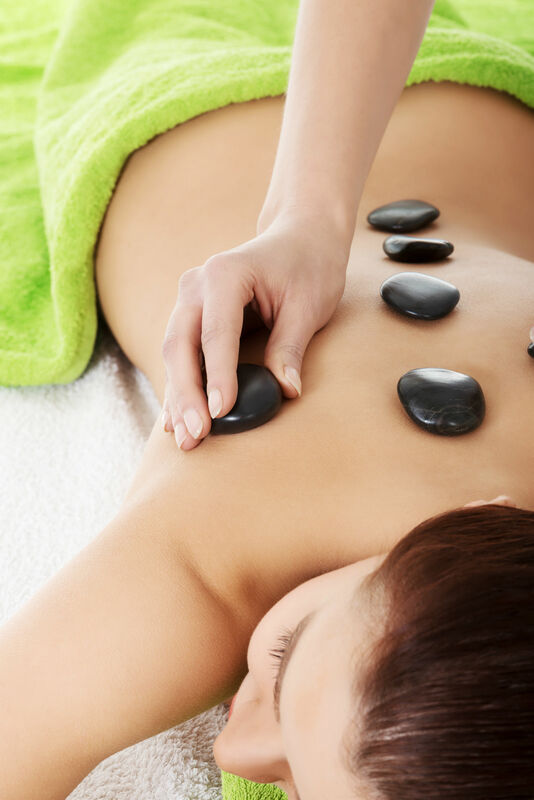 The stones are then used as tools to give the massage. Pressure can be deep or light and the warmth adds to the relaxation. A note of caution though, this can feel relaxing, but there is more chance of injury because an inexperienced therapist cannot feel the tissue beneath their hands and can go too deep. There is also the chance of being burned. This is a very common offering in spas, but make sure choose the therapist wisely. Deep tissue is, just like the name implies, deeper work on the muscles. Deep tissue utilizes knuckles, elbows, feet or tools. This is another popular spa modality (often with an up-charge) and is useful for aches, knots, tension and muscle pain. Contrary to popular belief this doesn’t have to hurt. If the pressure is too much during your massage, ask your therapist to lighten up. If they decline…get a new therapist. This is considered a more advanced technique and not every therapist has been properly trained in it. It’s not just harder Swedish so again, an inexperienced therapist can injure you. Sports massage is a combination of techniques specifically for the athlete. Very useful for pre and post event, sports massage stretches, kneads, shakes and uses deep pressure to help prevent and address injuries. Post event massage can calm the nervous system and help to flush the lactic acid out of the muscles, reducing recovery time. Trigger Point, Get to the Root of the Problem. Similar to deep tissue it searches out specific points, which refer pain to other parts of the body. This technique is based on two decades of research and was made popular in the 1980’s by doctors who mapped the trigger points and their referral patterns. Therapists use this technique for pain management, increased range of motion and rehabilitation after injuries. Not typically done in the spa environment, this is common amongst stand-alone practitioners and is my favorite modality in combination with deep tissue. Shiatsu, A Taste of Japan. Shiatsu works with energy meridians similar to those used in Acupuncture. It is performed on the floor and you stay fully clothed though some spas have moved it up on the table. Shiatsu isn’t just about the physical, it is used to tone and balance the energy and to calm or activate the system. It’s versatile; the compression used during shiatsu can be deeper in a pre-sport situation or lighter to help drain lymph. It doesn’t focus on specific muscle groups; it’s about the intention and the energy. Acupressure is similar with the exception that it focuses on individual points, not whole energy meridians and can be used for self-treatment. Thai massage, popular in modern spas, has been taught and practiced in Thailand for 2,500 years. This technique is performed on the floor, fully clothed and utilizes a lot of stretching and manipulating of the client’s limbs and torso. This can be physically intense so it’s not recommended for people who are injured. Barefoot, Step on the Wild Side. Barefoot or compressive deep tissue is a massage practice that uses the therapist’s feet instead of hands. Although similar techniques have been used in other countries for centuries, this American style grew out of a need for deeper, continuous pressure with less stress on the therapist’s hands and arms. This approach is performed on the floor with the client clothed. The therapists will often use a stick or wall brace to help support themselves as they manipulate your tissue. Rarely this is done on a table with a massage therapist standing above you using a bar support on the ceiling. Reflexology, More Than a Foot Massage. Reflexology, typically done on the feet but also popular on the hands and ears, follows a belief that every point on the body has a corresponding point on the foot. An ancient Chinese therapy, reflexology is especially useful for stress-related illness and emotional disorders. Traditionally this is not just a relaxing foot massage and in fact, can be incredibly painful. But most spas and foot massage locations have made it into something more relaxing and less clinical. Medical Massage, The New Kid. This is a category of massage, not really a technique on its own and is relatively new. It is used for injuries or rehabilitation and indicates that the therapist has training to address specific pathologies such as frozen shoulder, carpal tunnel, sciatica, disease states and others. These therapists often work with Chiropractors, Physical Therapists and Doctors. Some therapists use “medical massage” as a general term that differentiates them from “spa massage”. Reiki is a technique that a lot of massage therapists utilize but it’s not really a type of massage. Reiki (meaning Universal Life Force) is a hands-on healing technique that uses universal energy flowing through a practitioner into the person being healed. It heals on all levels of body, mind and spirit and is a great addition to a massage or as a stand-alone session. This has become a common offering in spas. I’m actually not a fan of that since I consider this more of a spiritual healing technique than a spa offering, but if the person is qualified, it can be fabulous. I hope this brief exploration of massage techniques proves helpful. Whichever massage you choose, may they be frequent and beneficial. To read the Luxe Beat Magazine version of this article click on the title Find The Right Rub For You.